The volumetric accuracy of machine tools is represented by a map of position and orientation error vectors of the tool over the volume concerned. Numerical compensation for volumetric error is possible in many latest commercial CNCs for machine tools. This paper reviews indirect measurement schemes for machine tool kinematics, in which the tool center position is measured as the superposition of error motions of linear or rotary axes. Each error motion can be separately identified by best-fitting a set of measured tool center positions to the kinematic model of machine tools. Indirect measurement schemes for the kinematics of three orthogonal linear axes, as well as the fiveaxis kinematics with two rotary axes, will be reviewed. S. Ibaraki and W. Knapp, “Indirect Measurement of Volumetric Accuracy for Three-Axis and Five-Axis Machine Tools: A Review,” Int. J. Automation Technol., Vol.6, No.2, pp. 110-124, 2012. ISO/PDTR 16907, “Numerical compensation of geometric errors of machine tools,” 2011. ISO/FDIS 230-1, “Test code for machine tools – Part 1: Geometric accuracy of machines operating under no-load or quasi-static conditions,” 2011. S. Sartori and G. Zhang, “Geometric Error Measurement and Compensation of Machines,” CIRP Annals – Manufacturing Technology, Vol.44, No.2, pp. 599-609, 1995. S. C. Veldhuis and M. A. Elbestawi, “A Strategy for the Compensation of Errors in Five-Axis Machining,” CIRP Annals – Manufacturing Technology, Vol.44, No.1, pp. 373-377, 1995. M. Weck, P. McKeown, R. Bonse, and U. Herbst, “Reduction and Compensation of Thermal Errors in Machine Tools,” CIRP Annals – Manufacturing Technology, Vol.44, No.2, pp. 589-598, 1995. H. Spaan, “Software error compensation of machine tools,” Ph.D. dissertation at Eindhoven University of Technology, 1995. R. Ramesh, M. A. Mannan, and A. N. Poo, “Error compensation in machine tools – a review: Part I: geometric, cutting-force induced and fixture-dependent errors,” Int. J. of Machine Tools and Manufacture, Vol.40, Issue9, pp. 1235-1256, 2000. S. Fletcher, S. R. Postlethwaite, and D. G. Ford, “Volumetric compensation through the machine controller,” Laser Metrology and Machine Performance V, pp. 321-330, 2001. E. L. J. Bohez, “Compensating for systematic error in 5-axis NC machining,” Computer Aided Design, Vol.34, Issue5, pp. 391-403, 2002. H. Schwenke, W. Knapp, H. Haitjema, A. Weckenmann, R. Schmitt, and F. Delbressine, “Geometric error measurement and compensation of machines – An update,” CIRP Annals – Manufacturing Technology, Vol.57, No.2, pp. 560-575, 2008. A.W. Khan andW. Chen, “A methodology for systematic geometric error compensation in five-axis machine tools,” Int. J. of Advanced Manufacturing Technology, Vol.53, No.5-8, pp. 615-628, 2010. ISO 230-2, “Test code for machine tools – Part 2: Determination of accuracy and repeatability of positioning numerically controlled axes,” 2006. ISO 230-4, “Test code for machine tools – Part 4: Circular tests for numerically controlled machine tools,” 2005. ISO 230-7, “Test code for machine tools – Part 7: Geometric accuracy of axes of rotation,” 2006. M. Tsutsumi and A. Saito, “Identification and compensation of systematic deviations particular to 5-axis machining centers,” Int. J. of Machine Tools and Manufacture, Vol.43, Issue8, pp. 771-780, 2003. Y. Abbaszadeh-Mir, J. R. R. Mayer, G. Cloutier, and C. Fortin, “Theory and simulation for the identification of the link geometric errors for a five-axis machine tool using a telescoping magnetic ball-bar,” Int. J. of Production Research, Vol.40, Issue18, pp. 4781-4797, 2002. M. Tsutsumi and A. Saito, “Identification of angular and positional deviations inherent to 5-axis machining centers with a tilting-rotary table by simultaneous four-axis control movements,” Int. J. of Machine Tools and Manufacture, Vol.44, Issue12/13, pp. 1333-1342, 2004. R. J. Hocken, J. A. Simpson, B. Borchardt, J. Lazar, C. Reeve, and P. Stein, “Three dimensional metrology,” Annals of CIRP, Vol.26, No.1, pp. 403-408, 1977. M. Donmez, D. Blomquist, R. Hocken, C. Liu, and M. Barash, “A general methodology for machine tool accuracy enhancement by error compensation,” Precision Engineering, Vol.8, No.4, pp. 187-196, 1986. A. Kurtoglu and G. Sohlenius, “The Accuracy Improvement of Machine Tools, CIRP Annals – Manufacturing Technology, Vol.39, No.1, pp. 417-419, 1990. J. Soons, F. Theuws, and P. Schellekens, “Modeling the errors of multi-axis machines: a general methodology,” Precision Engineering, Vol.14, No.1, pp. 5-19, 1992. V. S. B. Kiridena and P. M. Ferreira, “Kinematic modeling of quasistatic errors of three-axis machining centers,” Int. J. of Machine Tools and Manufacture, Vol.34, Issue1, pp. 85-100, 1994. J. A. Soons, “Analysis of the step-diagonal test,” Laser Metrology and Machine Performance VII, pp. 126-137, 2005. K. F. Eman, B. T. Wu, and M. F. DeVries, “A Generalized Geometric Error Model for Multi-Axis Machines,” CIRP Annals – Manufacturing Technology, Vol.36, No.1, pp. 253-256, 1987. S. Ibaraki, C. Oyama, and H. Otsubo, “Construction of an error map of rotary axes on a five-axis machining center by static R-test,” Int. J. of Machine Tools and Manufacture, Vol.51, Issue3, pp. 190-200, 2011. B. Bringmann and W. Knapp, “Model-based ’Chase-the-Ball’ calibration of a 5-axis machining center,” CIRP Annals – Manufacturing Technology, Vol.55, No.1, pp. 531-534, 2006. J. Bryan, “A simple method for testing measuring machines and machine tools. Part 2: Construction details,” Precision Engineering, Vol.4, No.3, pp. 125-138, 1982. A. Matsubara, K. Nagaoka, and T. Fujita, “Model-reference feedforward controller design for high-accuracy contouring control of machine tool axes,” CIRP Annals – Manufacturing Technology, Vol.60, pp. 415-418, 2011. C. Wang and B. Griffin, “A noncontact laser technique for circular contouring accuracy measurement,” Review of Scientific Instruments, 72-2, pp. 1594-1596, 2001. W. Knapp and S. Hrovat, “The Circular Test for Testing NC Machine Tools,” S. Hrovat, Zurich, 1987. G. T. Smith, C. Sims, A. D. Hope, and M. Gull, “A stereometric artefact for volumetric calibration of machining centres,” Laser Metrology and Machine Performance V, 2001. Y. Kakino, Y. Ihara, and A. Shinohara, “Accuracy Inspection of NC Machine Tools by Double Ball Bar Method,” Hanser Publishers, 1993. W. Knapp, “Test of the Three-Dimensional Uncertainty of Machine Tools and Measuring Machines and its Relation to the Machine Errors,” CIRP Annals – Manufacturing Technology, Vol.32, No.1, pp. 459-464, 1983. Y. Kakino, Y. Ihara, and Y. Nakatsu, “The Measurement of Motion Errors of NC Machine Tools and Diagnosis of their Origins by Using Telescoping Magnetic Ball Bar Method,” CIRP Annals – Manufacturing Technology, Vol.36, No.1, pp. 377-380, 1987. S.-W. Hong, Y.-J. Shin, and H.-S. Lee, “An efficient method for identification of motion error sources from circular test results in NC machines,” Int. J. of Machine Tools and Manufacture, Vol.77, Issue3, pp. 327-340, 1997. H. J. Pahk, Y. S. Kim, and J. H. Moon, “A New Technique for Volumetric Error Assessment of Machine Tools Incorporating Ball Bar Measurement and 3D Volumetric Error Model,” Int. J. of Machine Tools and Manufacture, Vol.37, Issue11, pp. 1583-1596, 1997. J.-M. Lai, J.-S. Liao, and W.-H. Chieng, “Modeling and analysis of nonlinear guideway for double ball bar (DBB) measurement and diagnosis,” Int. J. of Machine Tools and Manufacture, Vol.37, Issue5, pp. 687-707, 1997. G. H. J. Florussen, F. L. M. Delbressine, M. J. G. van de Molengraft, and P. H. J. Schellekens, “Assessing geometrical errors of multi-axis machines by three-dimensional length measurements,” Measurement, Vol.30, No.4, pp. 241-255, 2001. G. Florussen, F. Delbressine, and P. Schellekens, “Assessing Thermally Induced Errors of Machine Tools by 3D Length Measurements,” CIRP Annals – Manufacturing Technology, Vol.52, No.1, pp. 333-336, 2003. S.-H. Yang, K.-H. Kim, and Y. K. Park, “Measurement of spindle thermal errors in machine tool using hemispherical ball bar test,” Int. J. of Machine Tools and Manufacture, Vol.44, Issue2/3, pp. 333-340, 2004. ISO 230-6, “Test code for machine tools – Part 6: Determination of positioning accuracy on body and face diagonals (Diagonal displacement tests),” 2002. S. Ibaraki and T. Hata, “A new formulation of laser step diagonal measurement – Three-dimensional case,” Precision Engineering, Vol.34, No.3, pp. 516-525, 2010. L. Zhou and P. Vanherck, “A method for squareness error verification on a coordinate measuring machine,” Int. J. of Advanced Manufacturing Technology, Vol.21, pp. 874-878, 2003. T. J. Morris, “A new slant on diagonal laser testing,” Laser Metrology and Machine Performance V, pp. 29-40, 2001. M. Chapman, “Limitations of laser diagonal measurements,” Precision Engineering, Vol.27, No.4, pp. 401-406, 2003. J. Hwang, B. C. Bui, C. H. Lee, and C. H. Park, “Measurement of Axes Using Multi Diagonal Measurement Method,” Proc. of the 4th Int. Conf. on Positioning Technology, 2010. C. Wang, “Laser vector measurement technique for the determination and compensation of volumetric positioning errors. Part I: Basic theory,” Review of Scientific Instruments, Vol.71, No.10, pp. 3933-3937, 2000. J. Janeczko, B. Griffin, and C. Wang, “Laser vector measurement technique for the determination and compensation of volumetric position errors. Part II: Experimental verification,” Review of Scientific Instruments, Vol.71, No.10, pp. 3938-3941, 2000. H. Zhang, J. Yang, Y. Zhang, J. Shen, and C. Wang, “Measurement and compensation for volumetric positioning errors of CNC machine tools considering thermal effect,” Int. J. of Advanced Manufacturing Technology, Vol.55, No.1/4, pp. 275-283, 2010. Z. He, J. Fu, and X. Yao, “Volumetric Error Identification for CNC Machine Tool Based on Multi-body System and Vector Diagonal Measurement,” Proc. of Int. Sympo. on Precision Engineering and Micro/Nanotechnology (ISPEN), 2009. S. Ibaraki, T. Hata, and Matsubara, “A new formulation of laser step-diagonal measurement – two-dimensional case,” Precision Engineering, Vol.33, No.1, pp. 56-64, 2009. Y. Jianguo, R. Yongqiang, C. Wang, and G. Liotto, “Theoretical derivations of 4 body diagonal displacement errors in 4 machine configurations,” Laser Metrology and Machine Performance VIII, 2005. C. Wang and G. Liotto, “A theoretical analysis of 4 body diagonal displacement measurement and sequential step diagonal measurement,” Laser Metrology and Machine Performance VI, 2006. G. Zhang, R. Ouyang, B. Lu, R. Hocken, R. Veale, and A. Donmez, “A Displacement Method for Machine Geometry Calibration,” CIRP Annals - Manufacturing Technology, Vol.37, No.1, pp. 515-518, 1988. J. S. Chen, T.W. Kou, and S. H. Chiou, “Geometric error calibration of multi-axis machines using an auto-alignment laser interferometer,” Precision Engineering, Vol.23, No.4, pp. 243-252, 1999. G. Chen, J. Yuan, and J. Ni, “A displacement measurement approach for machine geometric error assessment,” Int. J. of Machine Tools and Manufacture, Vol.41, pp. 149-161, 2001. A. Balsamo, P. Pedone, E. Ricci, and M. Verdi, “Low-cost interferometric compensation of geometrical errors,” CIRP Annals – Manufacturing Technology, Vol.58, No.1, pp. 459-462, 2009. ISO 10360-2, “Geometrical product specifications (GPS) – Acceptance and reverification tests for coordinate measuring machines (CMM) – Part 2: CMMs used for measuring linear dimensions,” 2009. P. Cauchick-Miguel, “CMM verification: a survey,” Measurement, 17-1, pp. 1-16, 1996. G. Peggs, “Creating a Standards Infrastructure for Co-Ordinate Measurement Technology in the UK,” CIRP Annals – Manufacturing Technology, Vol.38, No.1, pp. 521-523, 1989. G. X. Zhang and Y. F. Zang, “A Method for Machine Geometry Calibration Using 1-D Ball Array,” CIRP Annals – Manufacturing Technology, Vol.40, No.1, pp. 519-522, 1991. E. Trapet, J. Aguilarmartin, J. Yague, H. Spaan, and V. Zeleny, “Self-centering probes with parallel kinematics to verify machinetools,” Precision Engineering, Vol.30, No.2, pp. 165-179, 2006. H. Kunzmann, “A Uniform Concept for Calibration, Acceptance Test, and Periodic Inspection of Coordinate Measuring Machines Using Reference Objects,” CIRP Annals – Manufacturing Technology, Vol.39, No.1, pp. 561-564, 1990. E. Trapet and F. Wiudele, “A reference object based method to determine the parametric error components of coordinate measuring machines and machine tools,” Measurement, Vol.9, Issue1, pp. 17-22, 1991. X. Mao, B. Li, H. Shi, H. Liu, X. Li, and P. Li, “Error measurement and assemble error correction of a 3D-step-gauge,” Frontiers of Mechanical Engineering in China, Vol.2, No.4, pp. 388-393, 2007. B. Bringmann, A. Küng, and W. Knapp, “A Measuring Artefact for true 3D Machine Testing and Calibration,” CIRP Annals – Manufacturing Technology, Vol.54, No.1, pp. 471-474, 2005. T. Liebrich, B. Bringmann, and W. Knapp, “Calibration of a 3D-ball plate,” Precision Engineering, Vol.33, No.1, pp. 1-6, Jan. 2009. A. Teimel, “Technology and applications of grating interferometers in high-precision measurement,” Precision Engineering, Vol.14, No.3, pp. 147-154, 1992. W. Gao and A. Kimura, “A Three-axis Displacement Sensor with Nanometric Resolution,” CIRP Annals – Manufacturing Technology, Vol.56, No.1, pp. 529-532, 2007. W. Knapp and S. Weikert, “Testing the contouring performance in 6 degrees of freedom,” Annals of the CIRP, Vol.48, No.1, pp. 433-436, 1999. K. Lee, S. Ibaraki, A. Matsubara, Y. Kakino, Y. Suzuki, S. Arai, and J. Braasch, “A Servo Parameter Tuning Method for High-speed NCMachine Tools based on Contouring ErrorMeasurement,” Laser Metrology and Machine Performance VI, WIT Press, 2002. K. Nagaoka, A.Matsubara, T. Fujita, and T. Sato, “Analysis Method of Motion Accuracy Using NC System with Synchronized Measurement of Tool-Tip Position,” Int. J. of Automation Technology, Vol.3, No.4, pp. 394-400, 2009. Z. Du, S. Zhang, and M. Hong, “Development of a multi-step measuring method for motion accuracy of NC machine tools based on cross grid encoder,” Int. J. of Machine Tools and Manufacture, Vol.50, Issue3, pp. 270-280, 2010. W. Zhu, Z. Wang, and K. Yamazaki, “Machine tool component error extraction and error compensation by incorporating statistical analysis,” Int. J. of Machine Tools and Manufacture, Vol.50, Issue9, pp. 798-806, 2010. S. Ibaraki and Y. Tanizawa, “Vision-Based Measurement of Two-Dimensional Positioning Errors of Machine Tools,” J. of Advanced Mechanical Design, Systems, and Manufacturing, Vol.5, No.4, pp. 315-328, 2011. E. Loewen, “Self-Calibration : Reversal, Redundancy, Error Separation, and ‘Absolute Testing’,” CIRP Annals – Manufacturing Technology, Vol.45, No.2, pp. 617-634, 1996. J. Ye, “An exact algorithm for self-calibration of two-dimensional precision metrology stages,” Precision Engineering, Vol.20, No.1, pp. 16-32, 1997. O. Sato, S. Osawa, and T. Takatsuji, “Calibration of two dimensional grid prates with the reversal measuring technique,” Proc. of Asian Sympo. for Precision Engineering and Nanotechnology (ASPEN), 2009. T. Saiki, M. Tsutsumi, and H. Suzuki, “Development of Measurement for Motion Accuracy of 5 Axis NC Machine Tool,” Int. J. of Automation Technology, Vol.2, No.2, pp. 111-118, 2008. H. Qiu, Y. Li, and Y. Li, “A new method and device for motion accuracy measurement of NC machine tools. Part 1: principle and equipment,” Int. J. of Machine Tools and Manufacture, Vol.41, Issue4, pp. 521-534, 2001. K. Iwasawa, A. Iwama, and K. Mitsui, “Development of a measuring method for several types of programmed tool paths for NC machine tools using a laser displacement interferometer and a rotary encoder,” Precision Engineering, Vol.28, No.4, pp. 399-408, 2004. H. Iwai and K. Mitsui, “Development of a measuring method for motion accuracy of NC machine tools using links and rotary encoders,” Int. J. of Machine Tools and Manufacture, Vol.49, Issue1, pp. 99-108, 2009. J. Ziegert and C. Mize, “The laser ball bar: a new instrument for machine tool metrology,” Precision Engineering, Vol.16, No.4, pp. 259-267, 1994. T. Schmitz and J. Ziegert, “Dynamic evaluation of spatial CNC contouring accuracy,” Precision Engineering, Vol.24, No.2, pp. 99-118, 2000. K.-C. Fan, H. Wang, F.-J. Shiou, and C.-W. Ke, “Design analysis and applications of a 3D laser ball bar for accuracy calibration of multiaxis machines,” J. of Manufacturing Systems, Vol.23, Issue4, pp. 338-338, 2004. T. Takatsuji, M. Goto, S. Osawa, R. Yin, and T. Kurosawa, “Wholeviewing-angle cat’s-eye retroreflector as a target of laser trackers,” Measurement Science and Technology, Vol.10, No.7, pp. 87-90, 1999. K. Lau, R. Hocken, and W. Haight, “Automatic laser tracking interferometer system for robot metrology,” Precision Engineering, Vol.8, No.1, pp. 3-8, 1986. A. Kohama, R. Mori, S. Komai, M. Suzuki, S. Aoyagi, J. Fujioka, and Y. Kamiya, “Calibration of kinematic parameters of a robot using neural networks by a laser tracking system,” Proc. of 7th Int. Conf. on Machine Automation, pp. 251-256, 2008. G. N. Peggs, “Virtual technologies for advanced manufacturing and metrology,” Int. J. of Computer Integrated Manufacturing, Vol.16, No.7/8, pp. 485-490, 2003. E. B. Hughes, A. Wilson, and G. N. Peggs, “Design of a highaccuracy CMMbased on multi-lateration techniques,” CIRP Annals – Manufacturing Technology, Vol.49, No.1, pp. 391-394, 2000. H. Schwenke, M. Franke, J. Hannaford, and H. Kunzmann, “Error mapping of CMMs and machine tools by a single tracking interferometer,” CIRP Annals – Manufacturing Technology, Vol.54, No.1, pp. 475-478, 2005. K. Umetsu, R. Furutnani, S. Osawa, T. Takatsuji, and T. Kurosawa, “Geometric calibration of a coordinate measuring machine using a laser tracking system,” Measurement Science and Technology, Vol.16, pp. 2466-2472, 2005. H. Schwenke, R. Schmitt, P. Jatzkowski, and C. Warmann, “Onthe-fly calibration of linear and rotary axes of machine tools and CMMs using a tracking interferometer,” CIRP Annals – Manufacturing Technology, Vol.58, No.1, pp. 477-480, 2009. S. Ibaraki, K. Takeuchi, T. Yano, T. Takatsuji, S. Osawa, and O. Sato, “Estimation of Three-Dimensional Volumetric Errors of Numerically Controlled Machine Tools by a Tracking Interferometer,” J. of Mechanics and Automation, pp. 313-319, 2011. T. Takatsuji, M. Goto, A. Kirita, T. Kurosawa, and Y. Tanimura, “The relationship between the measurement error and the arrangement of laser trackers in laser trilateration,” Measurement Science and Technology, Vol.11, No.5, pp. 477-483, 2000. ISO 10791-1, “Test conditions for machining centres – Part 1: Geometric tests for machines with horizontal spindle and with accessory heads (horizontal Z-axis),” 1998. ISO 10791-2, “Test conditions for machining centres – Part 2: Geometric tests for machines with vertical spindle or universal heads with vertical primary rotary axis (vertical Z-axis),” 2001. ISO 10791-3, “Test conditions for machining centres – Part 3: Geometric tests for machines with integral indexable or continuous universal heads (vertical Z-axis),” 1998. ISO/CD 10791-1, “Test conditions for machining centres – Part 1: Part 1: Geometric tests for machines with horizontal spindle and with accessory heads (horizontal Z-axis),” 2011. ISO 10791-6, “Test conditions for machining centres – Part 6: Accuracy of feeds, speeds and interpolations,” 1998. ISO/CD 10791-6, “Test conditions for machining centres – Part 6: Accuracy of feeds, speeds and interpolations, 2011. R. M. Mahbubur, J. Heikkala, K. Lappalainen, and J. A. Karjalainen, “Positioning accuracy improvement in five-axis milling by post processing,” Int. J. of Machine Tools and Manufacture, Vol.37, Issue2, pp. 223-236, 1997. Y. Abbaszaheh-Mir, J. R. R. Mayer, G. Clotier, and C. Fortin, “Theory and simulation for the identification of the link geometric errors for a five-axis machine tool using a telescoping magnetic ballbar,” Int. J. of Production Research, Vol.40, Issue18, pp. 4781-4797, 2002. S. Zargarbashi and J. Mayer, “Assessment of machine tool trunnion axis motion error, using magnetic double ball bar,” Int. J. of Machine Tools and Manufacture, Vol.46, Issue14, pp. 1823-1834, Nov. 2006. W. Lei, M. Sung, W. Liu, and Y. Chuang, “Double ballbar test for the rotary axes of five-axis CNC machine tools,” Int. J. of Machine Tools and Manufacture, Vol.47, Issue2, pp. 273-285, 2007. M. S. Uddin, S. Ibaraki, A. Matsubara, and T. Matsushita, “Prediction and compensation of machining geometric errors of five-axis machining centers with kinematic errors,” Precision Engineering, Vol.33, No.2, pp. 194-201, 2009. K. Dassanayake, M. Tsutsumi, and A. Saito, “A strategy for identifying static deviations in universal spindle head type multi-axis machining centers,” Int. J. of Machine Tools and Manufacture, Vol.46, Issue10, pp. 1097-1106, 2006. K. Dassanayake, C. Cui and M. Tsutsumi, “Accuracy evaluation method for multi-tasking turning centre,” Int. J. Mechatronics and Manufacturing Systems, Vol.4, No.3/4, pp. 285-303, 2011. M. Dasssanayake, M. Tsutsumi, K. Higashiyama, and K. Yamamoto, “An approach to estimate the inherent deviations by means of simultaneous five-axis motion,” Proc. of the 4th Int. Conf. on Leading Edge Manufacturing in 21st Century (LEM21), pp. 423-428, 2007. D. Yumiza, K. Utsumi, M. Tsutsumi, and R. Sato, “Accuracy Assessment of Synchronous Motion in Five-axis Machining Centers,” Proc. of the CIRP 2nd Int. Conf. on High Performance Cutting, 2006. W. T. Lei, I. M. Paung, and C.-C. Yu, “Total ballbar dynamic tests for five-axis CNCmachine tools,” Int. J. ofMachine Tools and Manufacture, Vol.49, Issue6, pp. 488-499, 2009. S. Weikert, “R-Test, a New Device for Accuracy Measurements on Five Axis Machine Tools,” CIRP Annals – Manufacturing Technology, Vol.53, No.1, pp. 429-432, 2004. S. Ibaraki, C. Hong, and C. Oyama, “Construction of an error map of rotary axes by static R-test,” Proc. of the 6th Int. Conf. on Leading Edge Manufacturing in 21st Century (LEM21), 2011. G. H. U. Florussen and H. A. M. Spaan, “Static R-Test: Allocating the Centreline of Rotary Axes of Machine Tools,” Proc. of the 8th Lamdamap Conference, pp.196-202, 2007. European patent, EP 1549459 B1, “System and process for measuring, compensating and testing numerically controlled machine tool heads and/or tables,” 2007. M. Slamani, R. Mayer, M. Balazinski, S. H. H. Zargarbashi, S. Engin, and C. Lartigue, “Dynamic and geometric error assessment of an XYC axis subset on five-axis high-speed machine tools using programmed end point constraint measurements,” Int. J. of Advanced Manufacturing Technology, Vol.50, No.9/12, pp. 1063-1073, 2010. L. Andolfatto, J. R. R. Mayer, and S. Lavernhe, “Adaptive Monte Carlo applied to uncertainty estimation in five axis machine tool link errors identification with thermal disturbance,” Int. 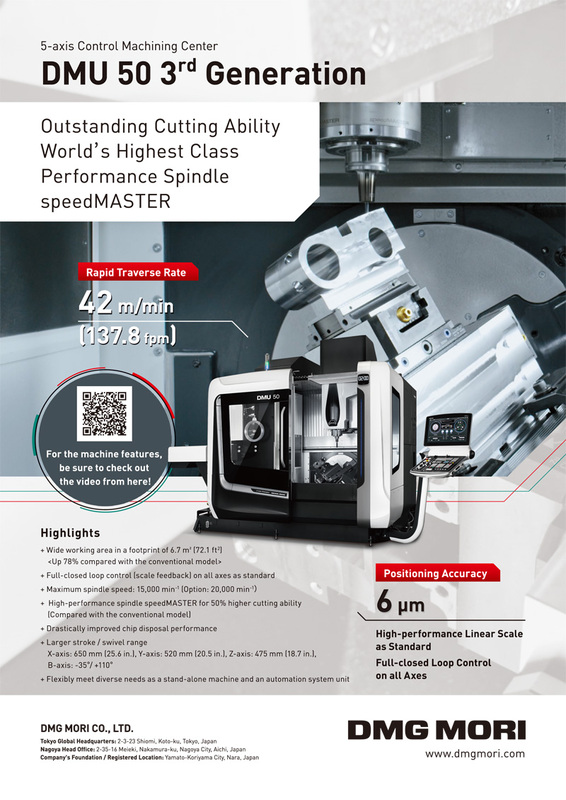 J. of Machine Tools and Manufacture, Vol.51, Issue7/8, pp. 618-627, 2011. W. T. Lei and Y. Y. Hsu, “Accuracy test of five-axis CNC machine tool with 3D probe-ball. Part I: design and modeling,” Int. J. of Machine Tools and Manufacture, Vol.42, Issue10, pp. 1153-1162, 2002. W. T. Lei and Y. Y. Hsu, “Accuracy test of five-axis CNC machine tool with 3D probe-ball. Part II: errors estimation,” Int. J. of Machine Tools and Manufacture, Vol.42, Issue10, pp. 1163-1170, 2002. C. Hong and S. Ibaraki, “Non-contact R-test for Dynamic Measurement on Five-axis Machine Tool,” Proc. of the 6th Int. Conf. on Leading Edge Manufacturing in 21st Century (LEM21), 2011. B. Bringmann, J. Besuchet, and L. Rohr, “Systematic evaluation of calibration methods,” CIRP Annals – Manufacturing Technology, Vol.57, No.1, pp. 529-532, 2008. B. Bringmann and W. Knapp, “Machine tool calibration: Geometric test uncertainty depends on machine tool performance,” Precision Engineering, Vol.33, No.4, pp. 524-529, 2009. B. Bringmann and P. Maglie, “A method for direct evaluation of the dynamic 3D path accuracy of NC machine tools,” CIRP Annals – Manufacturing Technology, Vol.58, No.1, pp. 343-346, 2009. Y. Ota and S. Ibaraki, “Evaluation of dynamic errors of rotary axis in five-axis machining centers at the reversing point,” Proc. of the JSME Mechanical Engineering Congress 2011, 2011. C. Hong and S. Ibaraki, “Observation of thermal influence on error motions of rotary axes on a five-axis machine tool by static R-test,” To be presented in Int. J. of Automation Technology, Vol.6, No.2, pp. 196-204, 2012. ISO 230-10, “Test code for machine tools – Part 10: Determination of measuring performance of probing systems of numerically controlled machine tools,” 2011. ISO 10360-3, “Geometrical Product Specifications (GPS) – Acceptance and reverification tests for coordinate measuring machines (CMM) – Part 3: CMMs with the axis of a rotary table as the fourth axis,” 2000. US Patent, US 7278222, “Method for measuring a programcontrolled machine tool,” 2007. T. Erkan and J. R. R. Mayer, “A cluster analysis applied to volumetric errors of five-axis machine tools obtained by probing an uncalibrated artefact,” CIRP Annals – Manufacturing Technology, Vol.59, No.1, pp. 539-542, 2010. T. Erkan, J. R. R. Mayer, and Y. Dupont, “Volumetric distortion assessment of a five-axis machine by probing a 3D reconfigurable uncalibrated master ball artefact,” Precision Engineering, Vol.35, pp. 116-125, 2011. S. Ibaraki, T. Iritani, and T. Matsushita, “Error Calibration on Fiveaxis Machine Tools by on-the-machine Measurement of Artifacts using a Touch-trigger Probe,” Proc. of 4th CIRP Int. Conf. on High Performance Cutting (CIRP HPC 2010), 2010. T. Hayashi, X. Liu, Y. Kiyoshi, K. Yamazaki, and M. Mori, “Laser-CCD Based Measurement System for Angular Motion of Integrated Machine Tools,” in Proc. of Int. Conf. on Leading Edge Manufacturing in 21st century (LEM21), pp. 85-90, 2005. NAS 979, “Uniform cutting test – NAS series. Metal cutting equipments,” 1969. ISO/CD 10701-7, “Test conditions for machining centres – Part 7: Accuracy of a finished test piece,” 2011. S. Bossoni and J. Cupic, “Test piece for simultaneous 5-axis machining,” Laser metrology and machine performance VIII, pp. 24-33, 2007. C. Hong, S. Ibaraki, and A. Matsubara, “Influence of positiondependent geometric errors of rotary axes on a machining test of cone frustum by five-axis machine tools,” Precision Engineering, Vol.35, No.1, pp. 1-11, 2011. H. Takeshima and Y. Ihara, “Finished Test Piece Example for Fiveaxis Machining Centers,” Proc. of the 5th Int. Conf. on Leading Edge Manufacturing in 21st century (LEM21), pp. 123-126, 2009. P. Lin and C. Tzeng, “Modeling and measurement of active parameters and workpiece home position of a multi-axis machine tool,” Int. J. of Machine Tools and Manufacture, Vol.48, Issue3/4, pp. 338-349, 2008. M. Bono and J. Kroll, “Tool setting on a B-axis rotary table of a precision lathe,” Int. J. of Machine Tools and Manufacture, Vol.48, Issue11, pp. 1261-1267, 2008. ISO 10701-7, “ Test conditions for machining centres – Part 7: Accuracy of a finished test piece,” 2006. ISO 13041-6, “Test Conditions for Numerically Controlled Turning Machines and Turning Centres. Part 6. Accuracy of a Finished Test Piece,” 2005. Y. Morimoto, K. Nakato, and M. Gontani, “Study on Accuracy Evaluation of Machining Center Based on Measurement Results of MachinedWorkpiece – Evaluation of Accuracy of 5-axis Controlled Machining Center –,” Proc. of the 6th Int. Conf. on Leading Edge Manufacturing in 21st century (LEM21), 2011. S. Ibaraki, M. Sawada, A. Matsubara, and T. Matsushita, “Machining tests to identify kinematic errors on five-axis machine tools,” Precision Engineering, Vol.34, No.3, pp. 387-398, 2010.